For a couple of weeks in late September and early October this year I was host to a world travelling Duck – Nacho. Made of rubber and wearing a scarf and weird hat, Nacho originated in California and had already traveled to a few people in the USA, visited Niagara Falls, England and New Zealand. Arriving in Australia he stayed with shed mate Steve who brought him up by plane to stay with me in Cairns. I took one look at those close together eyes and knew he’d be trouble – and he was!! First we had a Welcome Party, he drank all my booze and was found asleep on the table the next morning. The next day he saw my Model radio controlled planes and wanted to go for a fly – he’s a brave little guy. He met Rubber Ducky and FLEW!! I told him NOT to touch the red button!! He wanted to go up on the roof like he did at Steve’s – watch out the next hosts, this seems to be a favourite with him- ducks DO like to get high! Then he saw my Corvette, got a bit homesick, polished it and came for a drive with me. We drove up to the Northern Beaches, it was a great day for a drive with the roof off and his hat stayed on like it was part of him!! At this point, and I blame myself, Bruce came to visit and Marlow was infatuated by the big Aussie duck and went off with him!! Nacho was not a happy ducky!! He stole my model Biplane and attacked Bruce, firing the machine guns at him. After that he grabbed Marlow and stole my Corvette!! I managed to get some video from the security camera fitted to the Corvette, Nacho was driving recklessly, the music so loud I could hardly hear the tyres squealing!! But it seems that he won Marlow back and there’s a happy ending to that part of the story. Sharon spotted them parked in front of the Wagga Wagga Shopping Centre and she grabbed them – apparently they wouldn’t come quietly!! He arrived with his new girlfriend – Tacky Quacky who flew over from Florida! TQ is obviously smitten with Bruce, the Macho Aussie Duck! 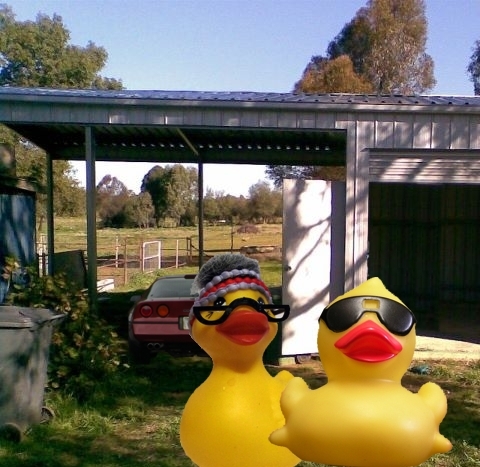 I checked the security camera fitted in the vette, Bruce and Tacky Quacky (TQ) are enjoying each others company as they drive back here! !